On 8 March 2019, Åland Post focuses on Nordic skating, an increasingly popular recreational winter activity. Based in Stockholm, the photographer behind the motif, Lasse Kärkkäinen, is an ardent skater. The winter season in Åland normally lasts from November until March or April. Skaters often follow shallow lakes on their first tours of the season. As the ice grows thicker around the coasts, skaters take trips on the estuaries and, in fine ice-winters, even out to sea. With a graphically streamlined image, Lasse wished to create a sense of open space in a setting of wide stretches and granite bedrock. He shot the photo of his two skating chums in early April some years ago. In the photo we see Sven M Pettersson gliding ahead of Rickard Svanström during a 106 km long day trip on the ice off northern Geta, cruising between the islets on their way to the sea edge. Lasse lets us know that the trip offered “fine ice as illustrated in the photo, older snow-covered ice, patches of flaky ice as well as open water”. 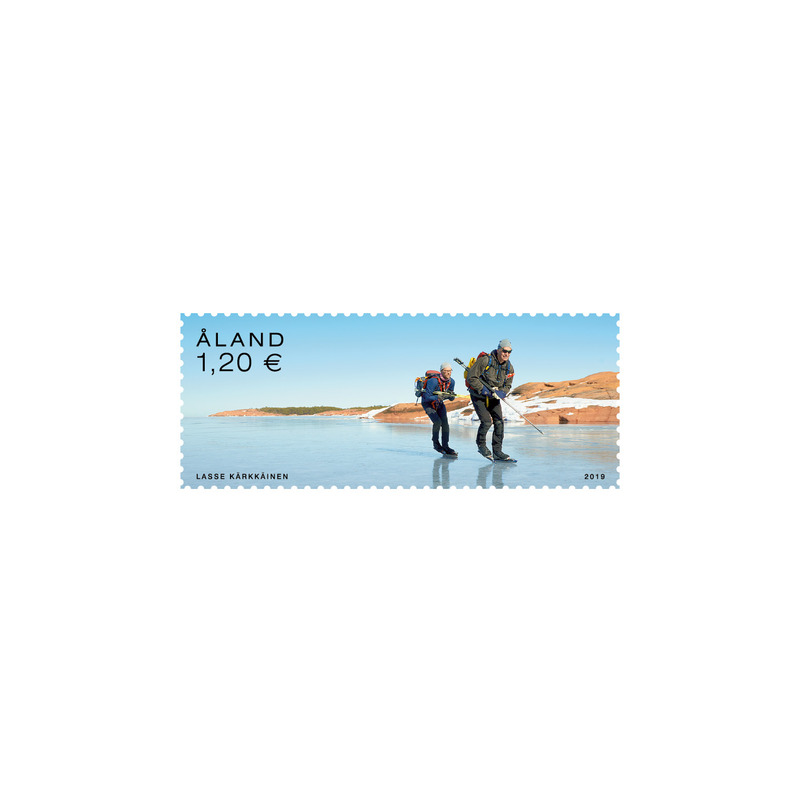 To order, please visit Åland Post Stamps web shop.